Limited to 25 participants. Sign up online here, by phone, or in person. 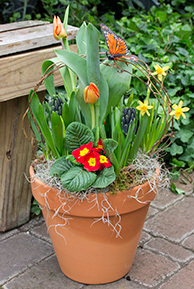 Plant up a 10"D terracotta pot with a glorious mix of spring bulbs to greet the new season! Class is held Saturday afternoon, March 23 from 2:00-3:30pm at Viviano Flower Shop, 32050 Harper Ave., St. Clair Shores, MI 48082. Please arrive early for registration completion if not already paid in full. Workshop fee: $50, payable in full; or reserve your place with a $10 deposit and pay the $40 remainder upon arrival. Hands-on guidance and all materials to make the design shown are provided. Plants and bloom colors may vary; some will be a beautiful surprise, as we'll start with them just beginning to bud for maximum lasting enjoyment.